Protesters at Oakland City Council demand a moratorium on evictions. Oakland, Calif. — Community activists organized by the Black Power Network marched into Oakland’s Kaiser Center Auditorium on March 18 demanding an end to development-driven displacement and calling for the city to declare a housing state of emergency. The protesters locked themselves across an entrance to the auditorium where the Oakland Chamber of Commerce’s Economic Development Summit was about to begin. About a hundred strong, the remaining activists filed into the auditorium, chanting to the accompaniment of the Brass Liberation Orchestra. Effectively shutting down the proceedings, BPN continued to chant, “Housing is a human right! 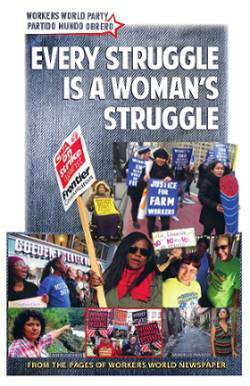 That is why we have to fight!” BPN organizer Carroll Fife said, “Oakland is not open for business until Oakland is open for business for everyone.” She was referring to the planned title of Mayor Libby Schaaf’s speech to the Chamber, “Oakland: Open for Business,” and to the fact that the average rent for an Oakland apartment is now over $3,000 a month. Several signs read: “Our housing crisis is not your profit opportunity. Eviction moratorium now!” Protesters demanded the City Council declare a housing state of emergency. Chamber of Commerce organizers had to formally announce the cancellation of the meeting, promising to reschedule the $95-a-seat affair. Oakland Mayor Libby Schaaf had been scheduled to give the opening remarks and an investment economist was to have made a major speech on real estate opportunities in Oakland. This action follows on the heels of the City Council’s 6-to-1 decision on March 15 to approve a luxury development on the publicly owned East 12th Street parcel of land, ignoring a year of protests calling for 100 percent affordable housing on the site. The parcel overlooks Oakland’s Lake Merritt, making it prime property in developers’ eyes. 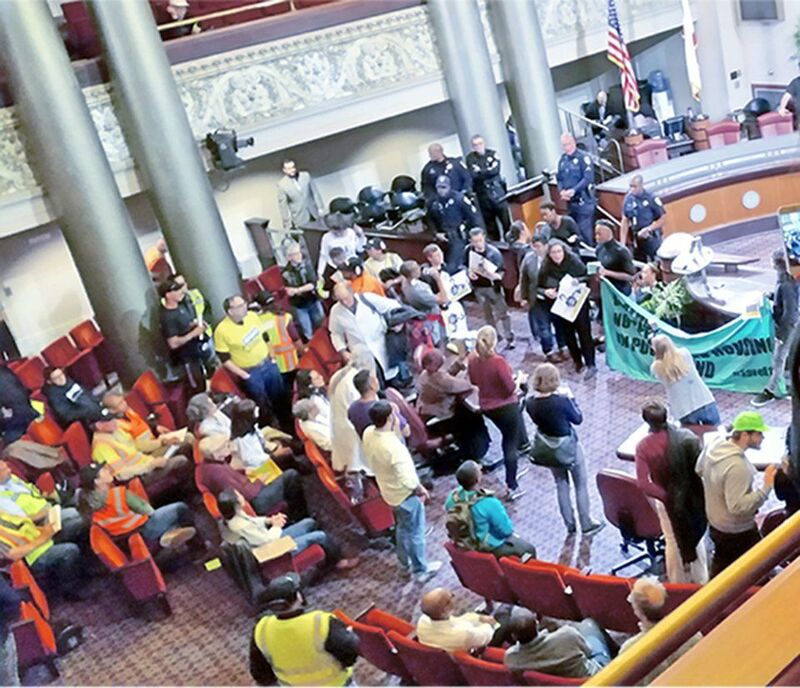 The “Save E. 12th Parcel for the People Coalition” had developed its own counterproposal featuring 100 percent affordable housing under the slogan “Public land for public good.” People locked themselves to posts in the Council chambers as several hundred people filled the main floor and the two balconies, chanting until the Council walked out. Council members reconvened in the mayor’s private chambers and held the vote approving the luxury development, while the people continued to chant and protest just outside the room.